Finding legal help at crucial moments can be unnerving and stressful at times. With so many lawyers in Singapore, it is almost impossible for consumers to figure out who is the best Singapore lawyer to take their case. The truth is that there isn’t a definitive list out there which ranks all the lawyers in Singapore from best to worst. “Best” is subjective and the most important thing is to find a lawyer that fits your needs. We have highlighted a few points which might help you in selecting the best Singapore lawyer for your case. Just like how there are General Practitioners and Specialists like Surgeons, the law profession is similarly structured with lawyers who practice in a variety of matters and specialist practitioners. It is advised that you search for the best Singapore lawyers within the practice area. If you are looking to buy a house, it is better to get a specialist conveyancing lawyer who handles a large volume of conveyancing request rather than a high-profile lawyer from a big name firm who might specialize in commercial litigation. By doing so, you can be assured that the lawyer has the relevant experience to help you at the right cost of service. This same guiding principle can apply to Accident and Personal Injury Claims, Divorce, Criminal cases and almost all other legal matters. It is always better for consumers to find a lawyer who specializes in the relevant practice area. You should always check for the lawyer’s area of practice before calling in to arrange for a consultation. Most law firms websites do indicate the specialization of their lawyers. Alternatively, if you want a consolidated site where you can view lawyers by specializations, you can visit ALN’s directory and search for lawyers based on their specializations or let Quick Consult help you find the most relevant qualified lawyers and schedule a 15-minute advice session on the phone. Some legal issues require immediate response while others are less time-sensitive. For example, if you just got into a traffic accident and require immediate assistance with a personal injury or insurance claim, you want to be able to get help quickly. In such cases, you do not have the luxury of taking the time to Google, research and shortlist of best lawyer. You are likely to care more about getting an immediate resolution rather than cost differences. If you have friends or family members who know lawyers, you can tap into that legal network to get a lawyer who is willing to help you out immediately. However, if you are planning to end your marriage and want to know your options thoroughly, it might be better to get a second opinion on issues. In such cases where the issue is less urgent, it is worthwhile for you to get a different/second opinion on the issue. By listening to several different point of views, you can then make an informed decision on the course of action you should take and hire the best lawyer to represent your case. Description The lawyer will agree for a fixed payment irrespective of the volume of work done. This usually happens for transactional taskings such as the drafting of an employment contract or for drafting the documents for an uncontested divorce The lawyer will charge for the number of hours it takes to handle your case. For a short-term issue that can be easily defined by a budget, it is recommended that you find a lawyer that can offer his or her service at a fixed fee. This applies to small matters of conveyancing or the drafting of relevant shareholders and employers agreement. However, if you have a long-term issue that requires more time to be resolved, it is more likely that you will be charged by billable hours. You should opt for a retainer agreement if you believe that it is important to have legal advice by a trusted lawyer for a fixed period of time. Billable hours rates differ across firms. The best Singapore lawyers in the biggest firms charge over a thousand dollars per hour while the lawyers in the smaller firms charge in the hundreds. The average for a senior associate level is $200-$400/hour, and more senior lawyers weigh in at >$1k/hour and are typically involved in the tasks that only they can handle over a junior associate. While the small boutique firms are able to offer competitive pricing at affordable rates, they might not have as much resources as big firms and may, therefore, decline to take on cases that are beyond their scope. They may also specialize in specific areas of law. On the other hand, while big firms usually charge more per hour, they usually have lawyers across all areas of practice and levels of experience and are able to deal with sophisticated and complex legal work that may involve multiple lawyers and specialties. A good tip is that you should request for a few quotations to understand the market rate for the particular legal service you are seeking rather than just accepting the first quote you get. The best Singapore lawyers should be able to estimate the cost and work that needs to be done for your legal issue. Legal issues can be either transactional or more long-term in nature. For instance, when you buy a house, the lawyer you get for the conveyance performs a transactional task. In such short-term interactions, what is more important is that the lawyer is competent in his task. However, if you are a Small Medium Business trying to build your business with sound legal input, what becomes more important is a lawyer that is committed and trustworthy. You want a lawyer who is familiar with your industry or who will take the time to become familiar with the challenges you face as a Small Medium Business. When you are hiring a lawyer to work on a long-term issue, it is strategic for both parties to share a good and working relationship. You should feel comfortable being honest with your lawyer. It is also important that both parties are able to freely communicate and keep each other updated on developments. Asia Law Network can help your search in several ways, particularly if you need help urgently and if you do not have a strong legal network to call on yourself. You might want to start by browsing from 1,000’s of practicing lawyers to narrow down your search to the most relevant lawyers. If you know what legal service you need, you might then want to request a free quotation from one of them from Asia Law Network, or reach out to them directly. If you are at a stage where your next step is to seek legal advice, consider getting a Quick Consult. With a Quick Consult, you can quickly get legal advice from a qualified and experienced practicing lawyer on the phone within 48 hours for a flat, transparent fee starting at S$49. Getting legal advice this way is affordable, risk-free and easy. This is why we typically suggest that customers get at one more Quick Consult to get a second opinion (read this article on the benefits of getting a second opinion) to get a different perspective to help you make better decisions. In the event that follow-on legal services are required, this gives you more options to compare lawyers. 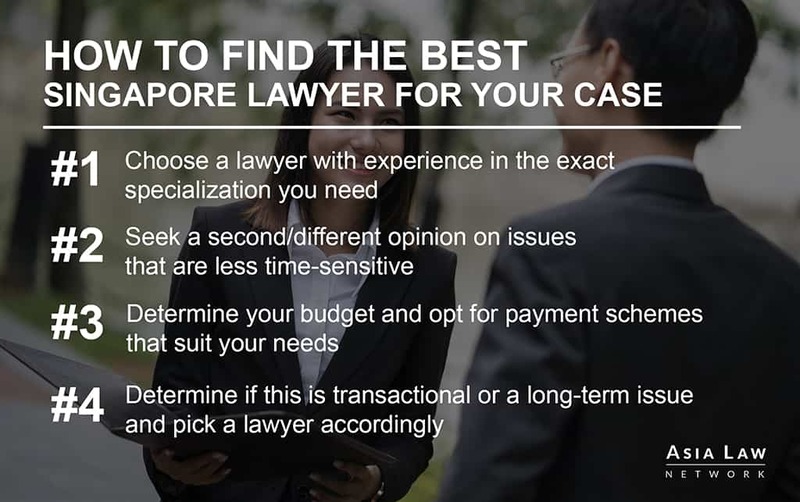 Remember, there are many factors to consider in selecting the best lawyer so having more data points will help you make the right decision on the best Singapore lawyer for you. This article is written by Seah Ern Xu from Asia Law Network. 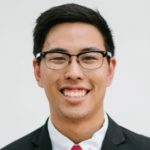 Ern Xu is a content strategist at Asia Law Network. He is a firm believer of making legal knowledge accessible for all.